“When bad times come, it’s very common to hear women crying, but not men. Here, the men are crying like anything. They can’t even speak. 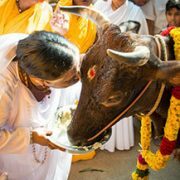 I’ve never seen anything like it.” According to one of Amma’s senior brahmacharis helping with the Ashram’s relief work in Tamil Nadu, this is the situation in many of the seaside villages of Chennai and Cuddalore. In Cuddalore, the ocean intruded more than two kilometres, destroyed the ripening nut harvest and rendered the land useless for farming for the next five years. 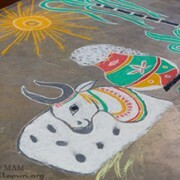 The 14th of January was Pongal. It’s a time for worshipping God in the form of the sun and for paying thanks for the harvest. This year, obviously the devotion of Cuddalore’s farmer’s was tested. 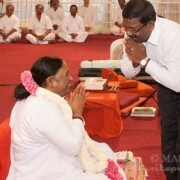 But Amma’s brahmacharis and devotees were there for them. 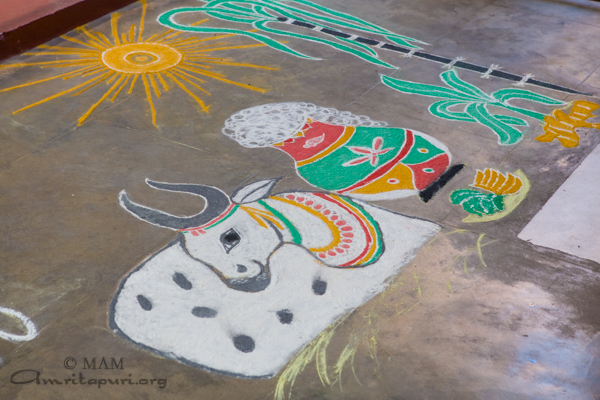 The day before the festival in the seaside villages of Pudukuppam, Cupudupettai and Kannikoil, they provided families with the essential Pongal provisions, namely ingredients for the traditional dishes (cereal, rice, jaggery, sugar, etc. ), as well as utensils, clothes and blankets. 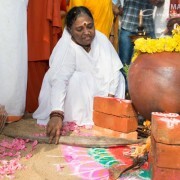 Amma’s brahmacharis spent Pongal itself in Chennai, singing bhajans, giving satsang and lighting the puja lamps in the villager’s houses. They also performed moksha deepam [prayer for the peace of the dead] in various places around South Chennai (Srinivasapuram, Kovalam, Foreshore Estate and Karukattukuppam), North Chennai (Kasimedu and Royapuram) and in Kanyakumari. Swami Ramakrishnananda performed the same puja in Nagapattinam and in Pondicherry. 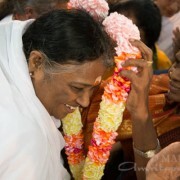 They were accompanied by busloads of devotees. And everywhere they went, they spent a lot of time with the villagers, talking to them and listening to their stories.